Wholesale jewelry orders: delivery 6-7 weeks, depending on order size (unless it's a stock order). 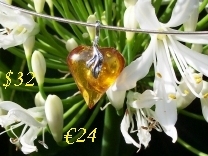 Complementary products are also available (sets of necklace or pendant, earrings, bracelet, ring). Prices for wholesale orders depend on total weight of ordered jewelry and on the quantity of the same product ordered (either 10 and multiplication of 10; the stock order is an exception - you can order quantities below 10). Auto-calculated quotation may be subject to correction in particular cases, but still can be used as price indication for a wholesale order. 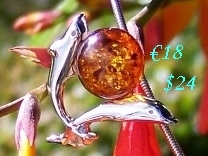 Some of our products - with big, handmade polished stone of amber - are a bit more expensive, but not very much. Prices exclude VAT, include Irish Hallmarking (Export from Ireland: there's "925" assay for silver parts instead). Each time, when you make an order, we do quotation (or verify auto-calculated quotation) and send it to you for your acceptance. If it's OK, we start work on your order. Once it's ready, you receive invoice pro-forma by email. As soon as we get your payment (or payment confirmation), we ship you the parcel.